The Nivaagaard Collection was originally a private collection created by landowner and politician Johannes Hage (1842-1923) in the years 1895-1905. Johannes Hage collected European art from the Renaissance and Baroque periods and Danish art from the Golden Age. Through a trust deed of September 30, 1908, he converted his private art collection into an independent institution open to the public. Previously, in 1903, he had hired the architect Johan Schrøder to erect a small temple for the art collection near Nivaagaard’s main building. Until his death in 1923, Johannes Hage was chairman of the board that ran the museum until 1981, when the first professional manager was appointed. In the period between 1960-81, the chairman position was held by architect Christian Hage, who made great efforts secure the museum’s economy and renovate the building, collection and park. Until the late 1970s, the museum was mostly self-financing, but as of 1979, the museum has received an annual grant from Karlebo Region and Frederiksborg Municipality. The local grants were a prerequisite that allowed Nivaagaard to become a state-recognised museum in 1983 with the right to receive government subsidies. In honour of the 75th anniversary of its establishment, the museum held its first special exhibition in 1983. In 1988, with support from the Velux Foundation of 1981 and the Knud Højgaard Foundation, the construction of a new exhibition space adjacent to the original one with a café and other visitor facilities was begun, based on plans by Royal Surveyor, architect MAA David Bretton-Meyer. In 1992, the Bergia Foundation funded a further expansion by Bretton-Meyer with exhibition halls, a storeroom and an office wing with a boardroom, which also serves as the headquarters for the foundation, although their administration was relocated in 1996. A close collaboration between the Bergia Foundation and The Nivaagaard Collection began. 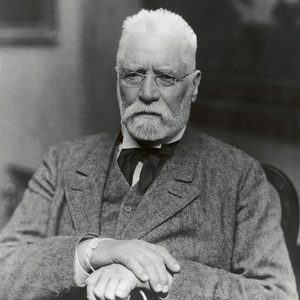 Johannes Hage (1842-1923) was born into a wealthy merchant family. After studies in economics, interrupted by his participation in the war in 1864, he settled on agriculture and inherited the country estate Nivaagaard from his father, the merchant Alfred Hage, in 1872. As a landowner, Johannes Hage was the patriarch of the local community, who took care of his employees’ welfare – and naturally, he belonged to the Danish conservative party, Højre. When he withdrew from politics in the 1890s, art collection became his great passion. He received valuable help from a friend and art connoisseur, captain Frederik Grünwaldt, as well as leading Danish and international museum professionals and art historians such as Karl Madsen, Gustavo Frizzoni and Hoofstede de Groot. Johannes Hage’s interest in art collection was a product of his upbringing in one of Copenhagen’s leading cultural environments. However, an equally important factor was his desire to restore Denmark’s reputation after the defeat in 1864 through the collection of the finest examples of European art.